Spotted on an old building in Mesilla. I’m not sure about the black lines- unless they are supposed to be folds. Lonnie and I went downtown yesterday for the Veterans’ Day Parade. There is something very moving about seeing the open display of patriotism in our divided world- and especially the veterans of World War II and more recent conflicts proudly wearing their uniforms to the cheers of the crowds. I always love the vintage uniforms- and was taken with the soldier on the right and his resemblance to George Washington – at least in my mind. I took my camera along to the cemetery when we attended my father-in-law’s graveside service last month, with the intention of getting some family group shots. There was a short service with military honors, and my husband was presented with the flag. It was a very emotional moment. 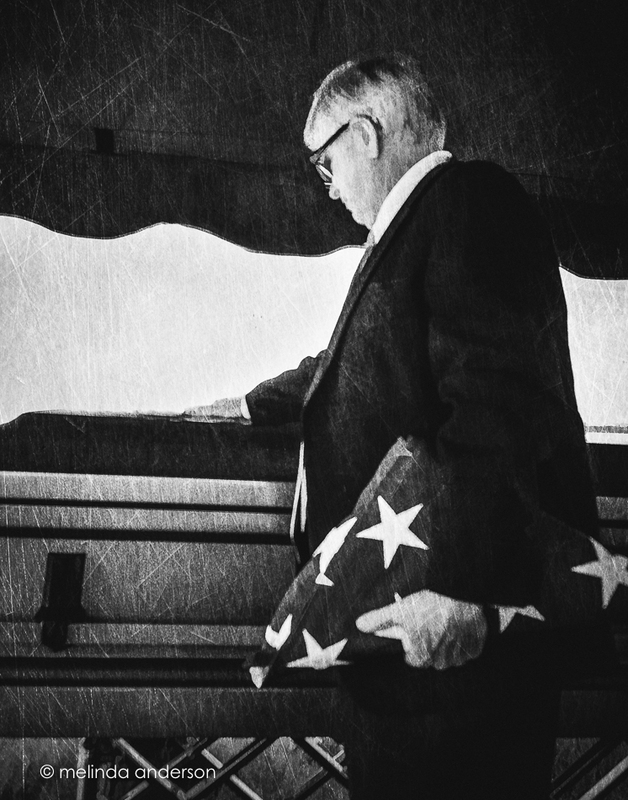 When my husband got up to leave, he walked in front of me and paused at the casket. The photographer in me couldn’t resist reaching for the camera and snapping one quick shot. Unfortunately, the autofocus on the camera had been turned off, because I had been using the Lensbaby previously- and, although this photo was in pretty good focus, all subsequent photos were out of focus until I realized what was going on- arrgghhh! I edited this one with Topaz Simplify and added some textures in Photoshop.